A reading from the gospel of Matthew 5:13-20. Listen for God’s word to us in this continuation of Jesus’ infamous Sermon on the Mount. Listen. Three years ago on my first Sunday as your interim pastor, the lectionary brought us together around this text; the very same part of Matthew’s telling of the Sermon on the Mount. . . . You may not remember it. But on that Sunday, I pulled out this prop (a container of salt) – I even told you I’d give you some at the sanctuary exit to keep in your pocket as a little reminder. . . . In a riveting sermon entitled “Salty Light,” I told you how difficult the winter of 2014 was around this country. Several states got hit hard with mounds of snow until many of those very same states – New York, Illinois, and other Northeastern and Midwestern spots – were in the middle of a salt crisis. They had put down so much salt to keep their roads safe and the snow melting for life to go on as usual, that salt supplies were dwindling away. If you’ve never lived in a state where snow covers the land from November til sometime around May, then it may be a bit difficult to understand the crisis of trying to live in winter without any salt! . . . Jesus knew the importance of salt – how treacherous life would be without it! One translation of Matthew 5:13 puts Jesus’ words this way: “Let me tell you why you are here. You’re here to be the salt-seasoning that brings out the God-flavors of this earth. If you lose your saltiness, how will people taste godliness? You’ve lost your usefulness and will end up in the garbage” (Eugene Peterson, The Message). . . . Jesus preached about the importance of salt because he knew it is essential. Not just for keeping life moving along smoothly in the dead of winter, but even more so for bringing out the flavors of this world – things like love, joy, peace, patience, kindness, goodness, faithfulness, gentleness, and self-control. Salt long has been a part of our faith ancestor’s life together. The traditional Jewish Seder includes a bowl of salt water on the table. Salt was to be a part of the sacrifices commanded by God. Leviticus tells of salt to be added with grain offerings (Lev. 2:13). And flesh offerings spoken of in Numbers remind of the covenant of salt – the sign of a perpetual covenant – the everlasting promise of God (Num. 18:19). Salt symbolizes a bond with the LORD God that stands forever. Salt was mixed with the people’s offerings as a pleasing reminder to them all. Not to mention that before refrigeration, salt was key for life – bringing the blood out of meat to ensure it was preserved; so, in turn, the people would be able to survive. O yes: Jesus knew, salt is essential to physical life even as it was a sign to God’s people of their everlasting spiritual life with their Maker. Perhaps to a crowd that was tired of dreary winter days that can drag on and on to weary your soul as your body yearns for just a little bit of sunshine, Jesus puts the words of Matthew 5’s next verse this way. According to the same translation quoted earlier, Jesus says: “You’re here to be the light, bringing out the God-colors in the world” (Matthew 5:14, Ibid.). Allowing the best of God’s Spirit that is in each of us to be seen. . . . In this light metaphor, Jesus was referencing the covenant God cut with Abraham. That his descendants, as numerous as the stars of the vast night sky, would be the light to all nations. . . . Israel constantly was reminded of being light. We heard it in Isaiah 58. That beautiful promise that if the people would serve the interests of those in need, instead of just their own self-focused ways; then “your light shall break forth like the dawn, and your healing shall spring up quickly . . . if you remove the yoke from among you” – in other words, that which weighs one another down . . . “If you offer your food to the hungry and satisfy the needs of the afflicted; then your light shall rise in the darkness, and your gloom be like the noonday.” You again shall become the light you were intended to be. As the prophet writes, “you shall be called the repairer of the breach (or that which is separated); the restorer of streets to live in” (Isaiah 58:8, 9b, 10, 12b). You shall be those who create communities of peace – that’s what the light of the world does as it shines in the darkest of places. Three years ago in my first sermon among you as your interim pastor, I told you that Jesus’ words aren’t just for those up on that mountain. His words are for you. For me. For every one of us baptized into his mission as followers of Christ Jesus our Lord and Savior. . . . We are the salt of the earth. We are light for the world! . . . We watch the news. We know a little salt certainly is needed now. The seasoning in our families and communities and nations that will bring out the God-flavors of this earth: a little love. A little joy. A little peace, patience, kindness, goodness, faithfulness, gentleness, and self-control. The blessed fruits of the Spirit! A true taste of godliness. . . . And light? Dark places of life yet exist – seem to be growing more each day. Someone, and it might as well be us, needs to shine a little so the vibrant colors of this world can be seen. . . . I heard the other day that there are 9,000 children in Davidson County who are on a waiting list for food through Second Harvest Food Bank. They truly need the food they get through public schools – and the donated extras received for weekends and holiday breaks. When you bring a pack of snacks to be boxed up for Tulip Grove Elementary students, you’re being salt. You’re bringing light. . . . 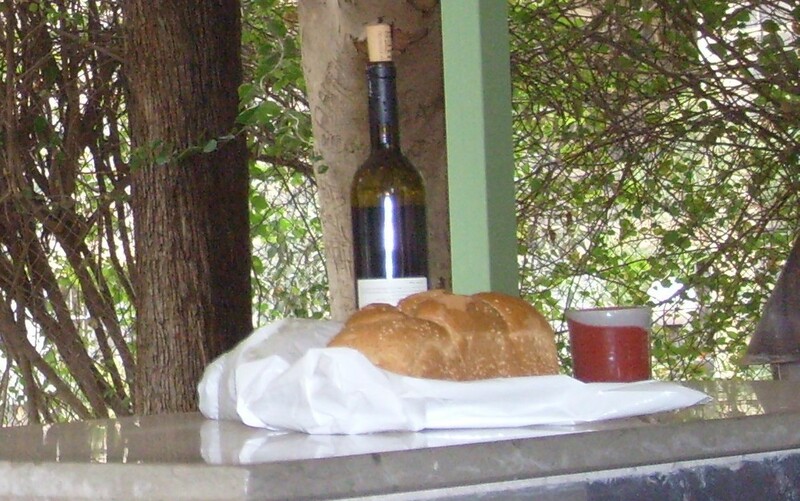 When you give a case of water for the homeless who are served through Room in the Inn, or for a family gathering at Hermitage Memorial Gardens to receive visitors prior to a service celebrating their loved one’s life; the God-flavors of generosity are tasted. The colors of compassionate care are seen. . . . When you stand at the sanctuary door to genuinely welcome someone who hasn’t dared entered here before, when you show kindness to the stranger at the grocery store. Maybe even, wherever you might be, you practice patience with a struggling mother whose hands are full with two fussy little ones. That’s being salt. That’s being light. That’s taking seriously Christ’s command for something beautiful to be taken in in this world. For something gorgeous to be seen. God’s ways. About us, the church; one archbishop says: “The church is the only organization on earth that exists for those who are not its members” (William Temple as quoted in Feasting on the Word, Yr. A, Vol. 1; Charles James Cook, p. 336). . . . The only group who gathers together to grow in giving ourselves away. . . . Since my first sermon as your interim pastor three years ago, I’ve seen that in you. The ways you continue to give yourself away. We certainly have had our times together of worshipping and learning and serving for the gracious love of God to be experienced among us. But we’ve kept to it always – at least I hope we have – so that we can get up from these pews at the end of Sunday worship to head out into the world to be salt. To be light. To give of time and energy and efforts for a homebound person in Hermitage to get a meal once a day. To be joyful and filled with hope among our neighbors even in the midst of health hardships, divided worldviews, and terrible difficulties around this globe. To be those able to speak a word of comfort among colleagues and cultivate inner peace for our calm to ripple out to soothe the troubled with whom we come in contact. Not for ourselves alone, but for all in this world who need to taste. For any who need to see. That’s what Jesus told us. It’s what we’ve been up to together these past three years and what we shall continue to be about wherever our paths shall lead . . . because we are salt for the earth. We are light for the world. . . . May it ever be so. This entry was posted in Sermons and tagged 5 February 2017 sermon, Light for the world, Matthew 5:13-20, Purpose of the Church, Salt for the earth on February 7, 2017 by RevJule.